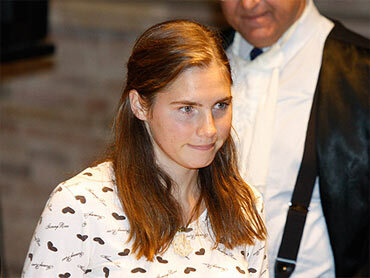 U.S. murder suspect Amanda Knox arrives in court in Perugia, Italy on Monday, Nov. 30, 2009. PERUGIA, Italy (CBS/AP) When Amanda Knox's parents arrived in Italy last Friday to support their daughter in her final days on trial for the November 2007 murder of her former roommate, Meredith Kercher, they discovered they were being sued by Italian police. Sperately in civil proceedings they also learned that the Kercher family is seeking $36 million in damages for their daughter's murder. 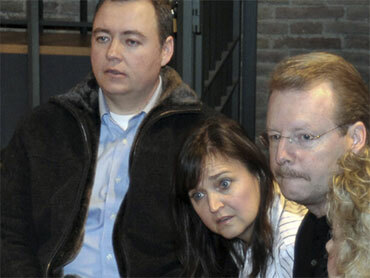 Photo: From left, Chris Mellas, Edda Mellas and Curt Knox. The Italian police filed a defamation suit against Knox's parents saying they allegedly accused them of beating their daughter during her interrogation. According to the Italian news agency ANSA the defamation investigation stems from a June 2008 interview Curt Knox and Edda Mellas gave to Britain's Sunday Times in which the couple accused the police of abusing Knox both physically and verbally during the course of their November 5, 2007 interrogation. They told the Sunday Times that Knox told them she "was hit in the back of the head by a police officer with an open hand at least twice". Edda Mellas told AP Television News on Saturday that she and her ex-husband found the timing of the lawsuit suspect. "It is odd that the timing is coming out now, five days before the end of the trial," she said. "This is supposed to be something that happened over a year ago." The police officers who were present at the interrogation apparently decided to pursue legal action as early as September 2008, according to ANSA which reported that the lawsuit is being brought by an unspecified number of Perugia police officers who deny mistreating Knox. Defamation through the press carries a sentence of six months to three years in prison and a fine, although a person with no prior police record is unlikely to serve time, according to reports. Separately in civil procedures on Friday November 27th, Francesco Maresca said that the Kercher family is requesting about $37 million in damages from the three poeple who are accused of the November 2007 killing, should they be convicted. Amanda Knox, of Seattle, co-defendant Raffaele Sollecito and Ivorian Rudy Hermann Guede, who was convicted in a separate trial, are named in the suit. This would mean that Knox could be liable for about $12 million if she is found guilty in her criminal trial. Italian law allows plaintiffs to attach requests for civil damages to criminal proceedings. During Friday's sessions, as part of a seperate suit, damages were also sought against Knox for Diya "Patrick" Lumumba - a Congolese man who owns a Perugia pub where Knox worked and whom the American initially accused of being the killer. Because of her accusation, Lumumba was briefly jailed. He was later cleared and is seeking defamation damages from Knox because he claims that she falsely accused him of the murder. Outside the court on Friday Curt Knox told reporters "We've been asked a number of times, you know, have we ever contacted them? And the answer is no. And until they know that Amanda had nothing to do with the loss of their daughter, with the murder of their daughter, I'm not sure that they'll be willing to accept our deepest condolences for the loss of her. And I truly look forward to that day being able to pick up the phone or talk to them in some manner, you know, saying how sorry we are for the loss of Meredith." 48 Hours Mystery looked at the case in a recent episode.